if I calculate the Q of a given area draining to an area inlet like the pic. Inlet is standard install by county. Does this inlet have Q capacity? The "capacity" will depend on how the grate is installed, and how much head is allowed, so there is no single value. A grate in a sump situation can typically handle more then a flush grate. 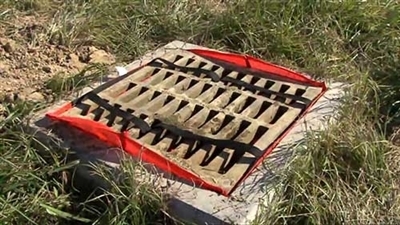 From your picture, the grate actually seems to be raised above the surrounding ground, which could cause much of the flow to bypass the grate. I'm guessing that you have an issue with the adequacy of this inlet? If so, more information is needed in order to provide meaningful feedback.